On Thursday, December 21, 2017 at approximately 4:40 a.m., two unknown suspects entered the gas station in the 10000 block of Harry Hines. The Black male suspect argued with the Latin male victim at the gas pumps. The Black male suspect then shot three victims, a Latin male, a Latin female and a 9-year-old child. Both suspects were last seen leaving in a gold Toyota sedan. Suspect 1 is a Black male with black curly hair and was last seen wearing a black jacket with blue jeans. Suspect 2 is a Latin male with short brown hair, a brown beard, and was last seen wearing a dark colored jacket with a white shirt and dark blue jeans. 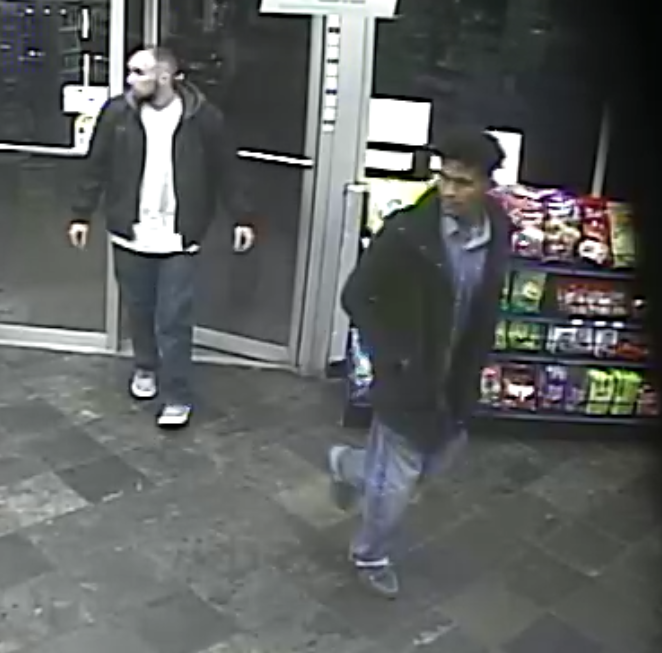 The Dallas Police Department is asking for the public’s assistance in identifying the suspects in this case. If you have any additional information or possibly came into contact with the suspects, please contact Detective E. Calhoun at (214) 671-3659 in the Dallas Police Department Assaults Unit.